Memoirs of a Hack Mechanic shipping now! Order now for Father's Day special offer! On Saturday, June 8th, former Corvette chief engineer Dave McLellan will give a seminar as part of the 2013 Ault Park Concours d'Elegance in Cincinnati, Ohio. McLellan's presentation will discuss the development of the brand-new Corvette C7 and how the Corvette has evolved from a body derivative of the Chevrolet passenger car to a leader in bringing new and important technology into high-performance sports cars. The event will also show off a 2014 C7, courtesy of Pete Kelly, Quality Launch Manager at Chevrolet's Corvette Assembly Plant in Bowling Green, KY. McLellan's seminar is free to the public, although advance registration is required. The Ault Park Concours d’Elegance is a nationally recognized car show that highlights some of the most spectacular automobiles and motorcycles of all time. The 2013 incarnation will feature an exhibit entitled Porsche: From Road to Racing and will also celebrate the 60th anniversary of the Corvette and 100 Years of Aston Martin. Dave McLellan's seminar will show the process of the Corvette has become a 200+ mph sports car that runs the fabled Nurburgring in 7 minutes and 19 seconds and is certainly not to be missed. The talk will take place Saturday, June 8th from 10:00 to 11:30 AM at the Carnegie Center of Columbia-Tusculum at 3738 Eastern Avenue in Cincinnati, OH. 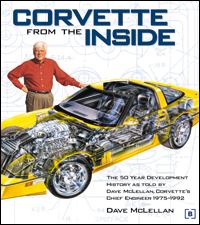 Dave McLellan was the Corvette chief engineer from 1975 to 1992 and is the author of the book Corvette from the Inside . Learn more about McLellan and download podcasts at www.corvettechief.com. For more information or to register for this seminar, visit http://cincyconcours.donordrive.com/index.cfm?fuseaction=donorDrive.event&eventID=538. To learn more about the 2013 Ault Park Concours d'Elegance, visit www.ohioconcours.com.